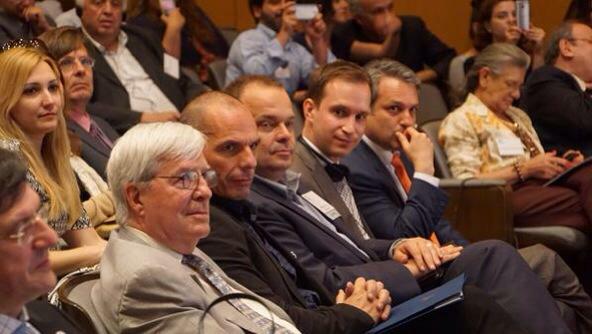 I just returned from a conference in Athens on the Greek economy. Yanis Varoufakis, Greece’s controversial Finance Minister, gave the (almost) final presentation to the 500 attendees making his usual point that Greece is insolvent not illiquid, meaning that its unsustainable debt should be written off (partially at least). While he is surely correct in that assessment, as usual he failed to discuss or even mention the structural reforms Greece needs to make to improve its productivity and thus lift its standard of living, which are also part of the conditions of the existing assistance program with the IMF/EU/ECB. He wants Greece’s creditors to forgive its debts first with reforms (which the new government says it wants to revers to some extent anyway) to come after. As past Greek behavior has destroyed any trust by its creditors and potential investors, the Troika (IMF/EU/ECB) is unlikely to agree to the Minister’s demands. The highlight of the conference was the critic of the Minister’s remarks by Nobel Prize economist Tom Sargent given immediately after and providing the actual concluding remarks for the day. This entry was posted in Economics, News and politics and tagged Atlas Network, austerity, Cato, ECB, EU, Greece, IMF, Thomas Sargent, Troika, Varoufakis. Bookmark the permalink. Warren, After having pulled Greece and the EU back from the edge of the cliff in 2011 through now, it seems folly to believe that the EU will permit Greece to exit the EU or to waive its debt. What should happen however, it the unification of the EU, the creation of an EU Treasury which would pass through Greece’s debt as the fed did Califronia’s debt back in 2009-11. The reinstating of the former government employees terminated by Greece in 2011 and forward was an irresponsible act if there ever was one (and Greece’s government has been guilty of many). There will be no Greek exit or any write down of debt in the future either. Reforms must continue and the debt must be repaid in Euros. Nice to hear from you again. Thought you retired. Apropos Mr Winkle’s comment: Don’t retire. This post makes clear, you have too much to contribute. If only you had a little Greek ancestry, they could make you a minister. The very prospect might encourage some sobriety over there.